Starting with WPUF v2.8, Admins will be able to send reminders to subscribers before and after their memberships expires. Navigate to wp-dashboard→User Frontend→Settings. From Settings, open then E-Mails page. Check the box for Enable Subscription Notification beside Subscription Notification. Send Notification Before: With this numeric field, select the number of days before the subscription ends on which you want to send the subscription expiration notice to your user. That is, this selects the day at which you want to send the pre-subscription expiration notice to the subscriber. 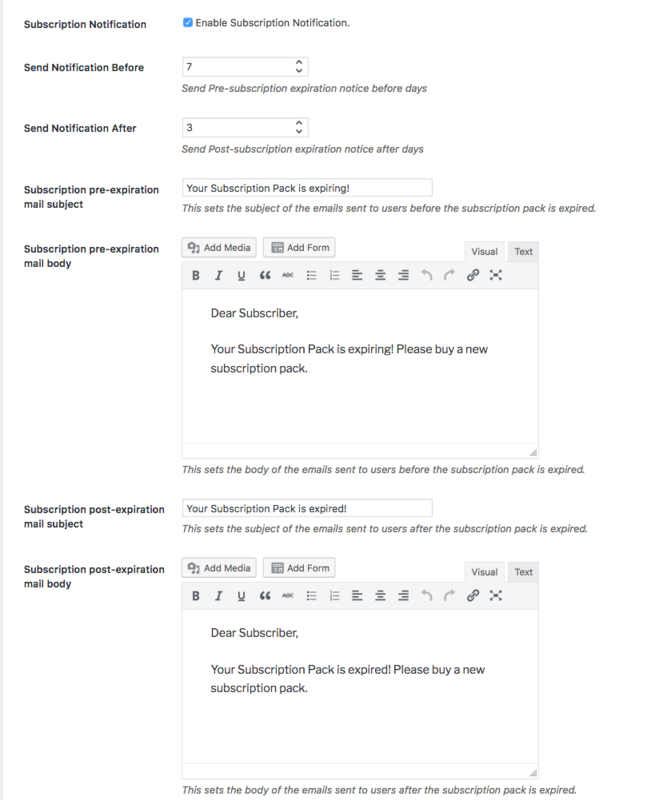 Send Notification After: With this numeric field, select the number of days after the subscription ends on which you want to send the subscription expiration notice. That is, this selects the day at which you want to send the post-subscription expiration notice to the subscriber. Subscription pre-expiration mail subject: In this field, type the e-mail subject you want to display to the subscriber for your pre-expiration notice. Subscription pre-expiration mail body: Here type the e-mail content for your pre-expiration notice. Subscription post-expiration mail subject: In this field, type the e-mail subject you want to display to the subscriber for your post-expiration notice. Subscription post-expiration mail body: Here type the e-mail content for your post-expiration notice. After configuring everything, click on Save Changes at the bottom of the page.